Unlike ERP or Accounting systems, BellHawk does not directly track inventory. Instead it tracks individual containers of material. It then can deduce the quantity of inventory in stock by adding up the quantities of materials in individual containers. The benefit of this is that BellHawk can not only track the quantity of materials in each containers but also the lot number and expiration date of the materials plus its location, who supplied or made it, its rolled up cost and other data such as its QC status as well as attributes such as color and size. The concept behind license-plate tracking is that a unique tracking barcode is applied to each container and then all the information about the container is stored in a database, where it can quickly be accessed. Also data about that container, such as its location, can quickly be changed by scanning the tracking barcode on the container. License plate tracking gets its name from what happens at the registry of motor vehicles when you go there to register a new car or truck. They hand you a license plate with a unique set of letters and numbers and the state of issue marked on the plate. The license plate number is unique but otherwise is just a random set of letters and numbers. All the data about your car or truck is stored in a database so that, when you get pulled over for speeding, the police officer simply reaches over to his on-board computer and types in your license plate number and is able to see all the information about your car or truck. We use a similar principal for license-plate tracking of materials except that we put a unique tracking barcode or RFID tag on each container instead of an aluminum license plate. Note this is very different from using barcodes with data such as item number, quantity, and lot number on each container. With license-plate tracking all the data is kept in a database and the tracking barcode is simply a reference to the database record. The benefit of this is that data such as location, quality control status, and cost can be changed as needed without replacing the barcode on the container. In many cases, we place permanent metal license-plate tracking barcodes on or RFID tags on these containers so they can be reused as materials are removed and entered. License-plate tracking is a GS1 (Global Supply Chain 1) standard, where GS1 standard barcodes are used for Serialized Shipping Container Code (SSCC) barcodes which uniquely identify the containers to which they are attached on a world-wide basis. This enables a shipper to record what materials were placed in on a pallet in China and send the information related to a warehouse in the USA in the form of an ASN (Advanced Shipment Notice). When the materials are received in the USA all that is necessary is to scan the SSCC license-plate barcode to receive the materials without first breaking down the pallet. 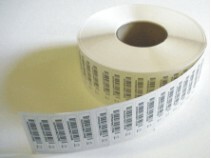 The license-plate tracking barcode may be as complex as a GS1 composite barcode, printed on-demand, with a GTIN, Lot Number, and Serial number, for use in the Global supply chain, or as simple as a barcode taken from a pre-printed roll of serialized barcodes, such as that shown here., for internal use within the plant. The license-plate tracking barcode may also contain an RFID chip with the same tracking number or a separate ruggedized RFID tag may be used depending on the application. 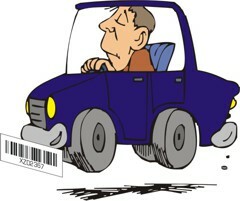 As well as being placed on containers, license plate tracking barcodes are placed on items that are not in containers. Examples include large electric motors and other electro-mechanical assemblies which may need to be tracked independent of being in an external container. These individually barcoded items may also have serial numbers which may be used as their tracking barcodes or the serial numbers may be different. The information about each container is kept within the Containers table in BellHawk, which is central to its ability to track materials. Each record contains the tracking barcode, the item number, the quantity in the container, the lot number, serial number, expiration date, location and many other data fields such as the type of container. Note that this is different from tracking the quantity of inventory at a location as, in BellHawk, there can be many different containers at the same location. Some types of container are obvious, such as boxes, pallets, and totes. Others are not so obvious, such as reels and rolls, which contain a quantity of an item. These can be treated as a container with so many feet, for example, of material, or as individually barcoded items where dimensions such as length, width, and thickness may be treated as attributes of the individually barcoded item. Please click here to learn more about "How BellHawk uses License Plate Tracking Methods to Track Inventory"